The Tandler precision right angle servo gearhead series FS provides the ultimate in motion control. 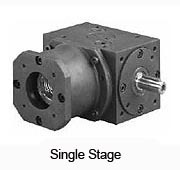 With hardened and lapped, matched-set spiral bevel gears and a revolutionary motor mount, maximum performance is assured in this single stage solution. 2 stage ratios available in series PSK2FS and series SKP2FS. 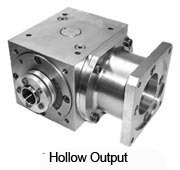 Low Backlash - Two levels of backlash optimize and enhance positioning accuracy. Revolutionary Motor Mount - A flexible motor connection eliminates misalignment and gear deflection. Corrosion Resistance Option - QPQ Nitriding process provides protection against high moisture environments. 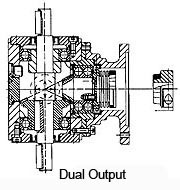 Auxiliary Outputs - Multiple outputs available for driving in several directions. Cast Iron Housing - Provides superior torsional rigidity over aluminum housings.